Get ready for the perfect cupcake that will instantly make you feel like you are in the season of autumn. 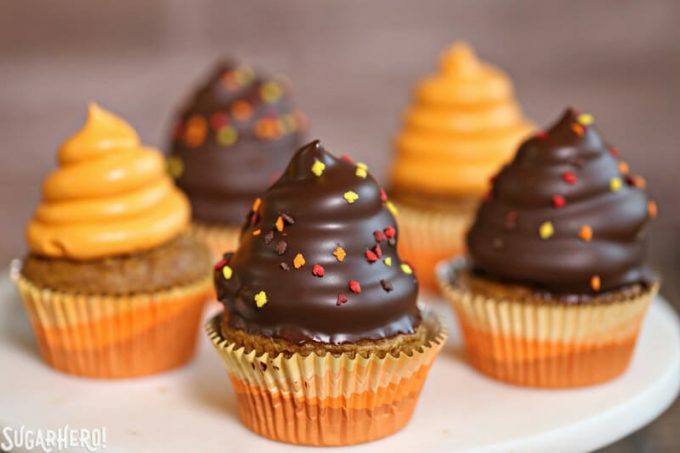 Pumpkin Spice Hi-Hat Cupcakes from Sugar Hero are just the thing. These cupcakes are filled with salted caramel. Frosted with a swirl of pumpkin spice that is smooth and creamy. The cupcakes are then dipped in semi-sweet chocolate. Finish off the cupcakes with your choice of sprinkles, such as fun fall sprinkles!